Curled once about the house, and fell asleep." — T. S. Eliot, "The Love Song of J. Alfred Prufrock"
In this week's Wednesday Werk, we'll look at the Withering Mist. The Withering Mist is less a creature and more an unnatural phenomenon. This putrid gas will sometimes erupt from graveyards and coalesce into vaporous entities that seek life force on which to feed. If they manage to completely drain a victim, that creature's withered flesh will frequently break apart to release another Withering Mist, thus forming a life cycle of the entity. The entity is fairly simplistic, but it does appear capable of merging with humanoid hosts — if they keep the entity fed, the entity will transfer some of that energy to the host, healing it. Some misguided magi and purveyors of dark secrets have entered into this bargain, but it almost always ends in death as the inhuman whims of the Withering Mist are too alien for a humanoid to balance. Killing sprees are common. 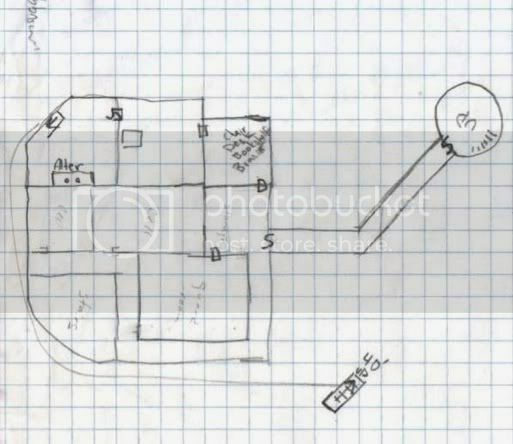 This Withering Mist specimen may represent a small cloud, or a smaller part of a large cloud (a standard level 7 encounter could feature five of these creatures, and it is totally reasonable to assume that they are part of the same miasmal cloud). A Withering Mist wades into combat, attacking foes with Enervating Miasma and Wither-Wight Bond. 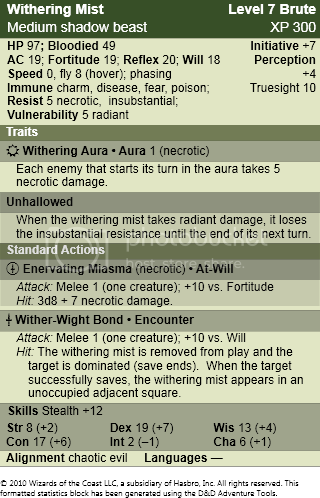 A Withering Mist will typically open combat by attempting Wither-Wight Bond, but a large group of them will stagger that attack so that enemies must still contend with Enervating Miasma and Withering Aura while one or two Withering Mists are out of play.